Chang Shou Gong has been popular in the Taihu (Lake Taihu) Region of South China for a long time. It is characterized by integration of mobile and quiescent exercises, convenience for practice both on land or in a boat, providing firmness and gentleness, and all-round positive effects. 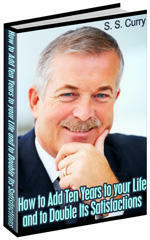 When it is practised persistently, the diseases may be cured and prolonging of life obtained. 1) The preparatory posture. Calm the mind and concentrate the thoughts, but do not be slack. Let Baihui face the sky. Lower the shoulders and drop elbows. Keep the armpits open, pull in the chest, tense the abdomen, relax the hips, contract the sphincter and bend the knees slightly, standing with the feet a shoulder width apart. Close the mouth and eyes slightly, touch the upper palate with the tip of tongue and breathe naturally. It is generally appropriate to stand in this way for 1 to 5 minutes. This posture is used both at the beginning and end .of the exercise. 2) Looking at the moon from the prow of a boat. Stand with feet a shoulder width apart and arms akimbo. Turn the head at first to the upper right with the eyes looking up the sky, and inhale sufficient air. Then, turn the head downward and exhale slowly (Fig. 14). Repeat the movements in this way 10 to 15 times. 3) Intercepting on the waist. Standing with feet a shoulder width apart. 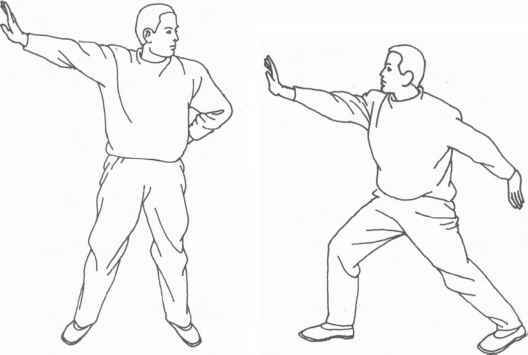 Put both hands on the back, with the centre of the back of one hand pressing lightly and accurately on the Shenshu of the same side and the palm of other hand covering accurately the Shenshu point of the other side, and rubbing it upward and downward 30 to 50 rounds. Then rub the opposite side with the palm of that side (Fig. 15). Repeat the movements, alternating 2 to 4 times. 4) Pushing the boat along with the current. Standing with feet a little wider than a shoulder width apart. Put the left hand on the side of the waist and push the right palm to the upper right until the arm is stretched straight. At the same time turn the head to the left with the eyes looking forward and inhale. After that, return to the original position and exhale. 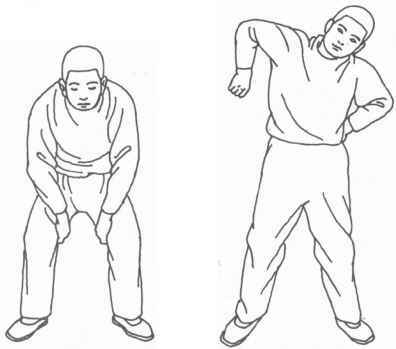 Then, do the same movements with the opposite hand (Fig. 16-1). Repeat, alternating 10 to 20 times. 5) Pushing the waves back and forth. Standing in the bow stance with the right leg at the front, push the right arm forward with the palm facing the front while drawing the left arm backward with its palm facing the back, and inhale. Then change the position of both arms and do the same movements, exhaling when changing. Repeat this 10 to 15 times. Then change the position of the legs and do the same movements. Repeat with alternated legs 2 to 4 times (Fig. 16-2). 6) One-armed general. Stand with feet separated by a little more than a shoulder width. Put the left hand on the side of the waist and stretch straight the right arm to the right horizontally. Make circles with 12 cm in diametre with the right arm, taking the shoulder joint as the axis. Breathe once for each circle. Rotate clockwise and counterclockwise, ten circles each. Then change the position of the arms. Repeat the movements with alternated arms 4 to 6 times. 8) Seething waters up and down. Stand with feet a little wider than a shoulder width apart. Clench both hands loosely and lift them up, but not beyond the level of the ear. Simultaneously rotate the arms forward defining circles 15 cm in diametre. Breathe once for one circle. Inhale during rotating upward while exhale during down ward movement. Repeat in this way altogether 15 to 25 times. backward. Then lift it higher with strength and at the same time throw out the chest, tense the belly and inhale twice vigourously with sound (Fig. 18). Exhale when lowering the right elbow to the same height as that of the left one. Change the position of the arms and do the same movements. Repeat 15 to 25 times. 13) Tiger's back and bear's waist. Stand with the feet apart slightly more than a shoulder width. Alternating, touch the back and the waist; the hands should reach the level of the first thoracic vertebra. Throw out the chest and inhale when the right hand is touching the back. Exhale when changing hands. Repeat 15 to 20 times, at a rate of not more than 10 times a minute. 16) A dolphin leaping out of water. Stand with the feet apart wider of the shoulders. Let the arms hang naturally at your sides. Begin the exercise by rotating both arms simultaneously to the back, then upward, inhaling at the same time. Jump up once or raise the heel up once when the hands reach their highest point. After that, rotate both arms simultaneously forward, then downward and exhale. Repeat the arms-rotating movements 10 to 15 times. 17) Attacking one side suddenly. Stand with the feet wider than a shoulder width. 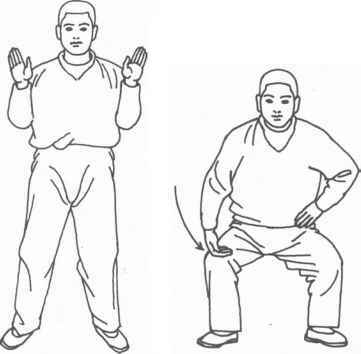 Hold the left hand akimbo and stretch the right palm and lift it to its highest position. Turn the waist to the left, vibrate the hand twice and inhale twice. After that, bring down the right hand to its former position while exhaling. Change to the left hand and do the same. Repeat this routine 10 to 15 times. 18) The prancing of a dragon and leaping of a tiger. Stand with the feet apart a little more than a shoulder width. Bend the knees slightly. Extend both arms to the sides of the body horizontally. 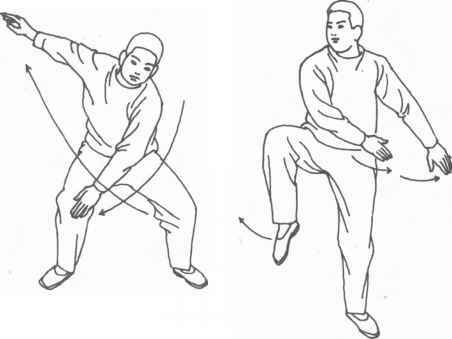 Touch the right knee with the left hand, then the left knee with right hand, moving along a wheel-like line (Fig. 19). Breathe once during the rotation. Repeat in this way 10 to 15 times. 19) Fishing out a pearl from the bottom of sea. Stand with the feet a shoulder width apart. Lift the right foot 10 cm above the ground and let it make 5-cm circles, then put it down. Breathe once for each circle. Rotate 6 to 8 times. Do the same with the left foot. Repeat the routine 4 to 10 times. 20) Turning round the heaven and earth. Stand with the feet apart wider than a shoulder width. Put the left hand on the middle part of the waist, bend the knees, and rotate the right hand beginning from the middle Dantian (the pectoral region) clockwise upward to the level of the lower jaw then downward to above the knees. Breathe once for each circle. After rotating 10 to 15 circles, change to the left hand to do the same. Repeat this routine 4 to 6 times. 23) Luring the dragon out of the water. Stand with the feet apart wider than a shoulder width. Swing the right arm in circular motion. Inhale when the right hand reaches the maximal height and exhale when it is falling down, swinging 10 to 15 times. Then change to the left arm in the same routine. Repeat 4 to 6 times. 25) Seizing the laurel. Stand with the feet apart at a distance less than a shoulder width. Clench the hands loosely, lifting them up and inhaling. Vibrate them twice when they reach the maximal height and inhale twice. Then bring down both hands while exhaling. Exercise 10 to 20 times. 27) Crane hovering in the air. Stand with the feet a little wider than a shoulder width apart. Extend both arms to the sides horizontally, squat down and stand up alternatively, and flap both arms like a crane flapping its wings in flight. Bending down and standing should be the main movements, arms moving passively. Breathe once for each "flap." Repeat the movements 10 to 20 times. 28) Making a stormy sea stormier. Stand with the feet apart a little wider than a shoulder width. Retract both hands in front of the shoulders with the palms facing forward (Fig. 21). Rotate the arms from the upper side downward laterally. Breathe once for each circle. Repeat the movements 10 to 20 times. 30) Fishing out the moon from the lake. Stand with the feet greater than a shoulder width apart. Squat down a little with left hand akimbo. Make the right hand a spoon-like form with the palm facing up and rotate it from the lateral upper side downward to the inner side, passing the knee. Thus a large circle is made as though "fishing out" the moon (Fig. 22). Then stand up and inhale. Exhale while squatting again. Repeat 10 to 15 times. After that, do these movements with the left hand. Exercise alternating hands in this way 4 to 6 times.